And it's not just a few thousand, but a majority of the state's residents. 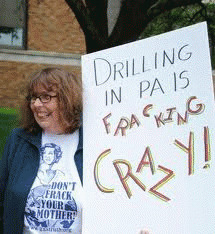 A joint University of Michigan/Muhlenberg College study reveals that only 49 percent of Pennsylvanians support shale gas extraction and 58 percent of all Pennsylvanians want the state to order "time out" until the health and environmental effects of fracking can be fully analyzed. That same study revealed that 60 percent of Pennsylvanians believe fracking poses a major risk to ground water resources, only 28 percent disagree; 12 percent have no opinion. Petitions with more than 100,000 signatures requesting a moratorium were delivered to Gov. Tom Corbett in April. As is typical for the man who willingly accepted more than $1.8 million in campaign contributions from the oil and gas industry, it didn't matter. High-volume hydraulic horizontal fracturing, better known as fracking, requires per well three to nine million gallons of fresh water, about 10,000 tons of silica sand, and about 100,000 gallons of a lubricant mixture that the drilling companies won't reveal the contents. However, a U.S. House of Representatives study suggests that of about 750 chemicals that could be used in that solution--every well and every company uses a different mixture--about 650 are toxic or known carcinogens. That mixture is forced into the earth, past the aquifers that provide drinking water, and then is brought up and placed into plastic-liner storage bins, where it is eventually loaded into trucks that travel throughout Pennsylvania, occasionally leaking onto the roads, and usually into Ohio, where millions of gallons of the fluids are forced back into the earth. Scientific evidence now links those deep injection wells to earthquakes. Scientists have also shown health and environmental effects from fracking, and that methane, an explosive greenhouse gas extracted from the earth, has added to the problems of climate change. So, if almost three-fifths of all residents want fracking to stop, who's opposing the moratorium? Just about anyone in a political leadership position. They tend to be the ones who from their own houses can't see drilling rigs, well pads, frack pits, and frack trucks that block access roads. They tend to be the ones who have deliberately twisted the facts and now squawk about how fracking the earth has helped create jobs and improve the economy, while ignoring the problems already proven that affect their constituents' health, environment, and food supply. The Democrats' resolution had begun in February. Sue Lyons, an attorney, had proposed the resolution. However, the Rules Committee of the Democratic Party Central Committee did not allow it to go forward, questioning its legality. To make sure the resolution was not in the best interest of Pennsylvania, the party even contacted the Department of Environmental Protection, the same DEP that has policies that block full transparency, that has a policy to "educate" rather than penalize gas companies that violate state pollution standards, and for two years had been run by a political crony of Gov. Corbett. The DEP agreed with what passes as Democratic leadership--the resolution was out of order. Before the delegates, Feridun argued that contrary to politician and industry claims, no one can say that fracking is safe because the chemicals are protected from disclosure under an exception to the Safe Water Drinking Act, the exception having been pushed through during the Bush--Cheney administration. The Michigan/Muhlenberg poll reveals that 91 percent of all Pennsylvanians believe fracking companies should disclose all chemicals used in the process. Feridun argued that frack waste is so radioactive that landfills and sewer plants won't accept it, that fracking has led to massive fish kills. But, most important, fracking has led to health problems, and even the DEP has had to acknowledge there have been at least 160 identified cases of contaminated water wells because of nearby fracking. The Democratic leadership, somewhat parroting the Republicans, didn't accept that democracy prevailed in the state central committee. Vice-chair Penny Gerber, who lives in Montgomery County, which is exempt from fracking, called fracking "a thriving industry." Gerber is an associate at a PR firm whose clients include large energy companies.